This article is about the Austrian-Swiss physicist. For the German physicist, see Wolfgang Paul. Wolfgang Ernst Pauli (/ˈpɔːli/; German: [ˈvɔlfɡaŋ ˈpaʊli]; 25 April 1900 – 15 December 1958) was an Austrian-born Swiss and American theoretical physicist and one of the pioneers of quantum physics. In 1945, after having been nominated by Albert Einstein, Pauli received the Nobel Prize in Physics for his "decisive contribution through his discovery of a new law of Nature, the exclusion principle or Pauli principle". The discovery involved spin theory, which is the basis of a theory of the structure of matter. Pauli was born in Vienna to a chemist Wolfgang Joseph Pauli (né Wolf Pascheles, 1869–1955) and his wife Bertha Camilla Schütz; his sister was Hertha Pauli, the writer and actress. Pauli's middle name was given in honor of his godfather, physicist Ernst Mach. Pauli's paternal grandparents were from prominent Jewish families of Prague; his great-grandfather was the Jewish publisher Wolf Pascheles. Pauli's father converted from Judaism to Roman Catholicism shortly before his marriage in 1899. Pauli's mother, Bertha Schütz, was raised in her own mother's Roman Catholic religion; her father was Jewish writer Friedrich Schütz. Pauli was raised as a Roman Catholic, although eventually he and his parents left the Church. He is considered to have been a deist and a mystic. Sommerfeld asked Pauli to review the theory of relativity for the Encyklopädie der mathematischen Wissenschaften (Encyclopedia of Mathematical Sciences). Two months after receiving his doctorate, Pauli completed the article, which came to 237 pages. It was praised by Einstein; published as a monograph, it remains a standard reference on the subject to this day. Pauli spent a year at the University of Göttingen as the assistant to Max Born, and the following year at the Institute for Theoretical Physics in Copenhagen, which later became the Niels Bohr Institute in 1965. From 1923 to 1928, he was a lecturer at the University of Hamburg. During this period, Pauli was instrumental in the development of the modern theory of quantum mechanics. In particular, he formulated the exclusion principle and the theory of nonrelativistic spin. In 1928, he was appointed Professor of Theoretical Physics at ETH Zurich in Switzerland where he made significant scientific progress. He held visiting professorships at the University of Michigan in 1931, and the Institute for Advanced Study in Princeton in 1935. He was awarded the Lorentz Medal in 1931. At the end of 1930, shortly after his postulation of the neutrino and immediately following his divorce and the suicide of his mother, Pauli experienced a personal crisis. He consulted psychiatrist and psychotherapist Carl Jung who, like Pauli, lived near Zurich. Jung immediately began interpreting Pauli's deeply archetypal dreams, and Pauli became one of the depth psychologist's best students. He soon began to criticize the epistemology of Jung's theory scientifically, and this contributed to a certain clarification of the latter's thoughts, especially about the concept of synchronicity. A great many of these discussions are documented in the Pauli/Jung letters, today published as Atom and Archetype. Jung's elaborate analysis of more than 400 of Pauli's dreams is documented in Psychology and Alchemy. Pauli made many important contributions as a physicist, primarily in the field of quantum mechanics. He seldom published papers, preferring lengthy correspondences with colleagues such as Niels Bohr and Werner Heisenberg, with whom he had close friendships. Many of his ideas and results were never published and appeared only in his letters, which were often copied and circulated by their recipients. Pauli proposed in 1924 a new quantum degree of freedom (or quantum number) with two possible values, in order to resolve inconsistencies between observed molecular spectra and the developing theory of quantum mechanics. He formulated the Pauli exclusion principle, perhaps his most important work, which stated that no two electrons could exist in the same quantum state, identified by four quantum numbers including his new two-valued degree of freedom. The idea of spin originated with Ralph Kronig. George Uhlenbeck and Samuel Goudsmit one year later identified Pauli's new degree of freedom as electron spin, a discovery in which Pauli for a very long time wrongly refused to believe. In 1930, Pauli considered the problem of beta decay. In a letter of 4 December to Lise Meitner et al., beginning, "Dear radioactive ladies and gentlemen", he proposed the existence of a hitherto unobserved neutral particle with a small mass, no greater than 1% the mass of a proton, in order to explain the continuous spectrum of beta decay. In 1934, Enrico Fermi incorporated the particle, which he called a neutrino, into his theory of beta decay. The neutrino was first confirmed experimentally in 1956 by Frederick Reines and Clyde Cowan, two and a half years before Pauli's death. On receiving the news, he replied by telegram: "Thanks for message. Everything comes to him who knows how to wait. Pauli." In 1940, he re-derived the spin-statistics theorem, a critical result of quantum field theory which states that particles with half-integer spin are fermions, while particles with integer spin are bosons. In 1949, he published a paper on Pauli–Villars regularization: regularization is the term for techniques which modify infinite mathematical integrals to make them finite during calculations, so that one can identify whether the intrinsically infinite quantities in the theory (mass, charge, wavefunction) form a finite and hence calculable set which can be redefined in terms of their experimental values, which criterion is termed renormalization, and which removes infinities from quantum field theories, but also importantly allows the calculation of higher order corrections in perturbation theory. Pauli made repeated criticisms of the modern synthesis of evolutionary biology, and his contemporary admirers point to modes of epigenetic inheritance as supportive of his arguments. The Pauli effect was named after the anecdotal bizarre ability of his to break experimental equipment simply by being in the vicinity. Pauli was aware of his reputation and was delighted whenever the Pauli effect manifested. These strange occurrences were in line with his investigations into the legitimacy of parapsychology, particularly his collaboration with C. G. Jung on the concept of synchronicity. Regarding physics, Pauli was famously a perfectionist. This extended not just to his own work, but also to the work of his colleagues. As a result, he became known in the physics community as the "conscience of physics," the critic to whom his colleagues were accountable. He could be scathing in his dismissal of any theory he found lacking, often labelling it ganz falsch, utterly wrong. However, this was not his most severe criticism, which he reserved for theories or theses so unclearly presented as to be untestable or unevaluatable and, thus, not properly belonging within the realm of science, even though posing as such. They were worse than wrong because they could not be proven wrong. Famously, he once said of such an unclear paper: "It is not even wrong!" His supposed remark when meeting another leading physicist, Paul Ehrenfest, illustrates this notion of an arrogant Pauli. The two met at a conference for the first time. Ehrenfest was familiar with Pauli's papers and was quite impressed with them. After a few minutes of conversation, Ehrenfest remarked, "I think I like your Encyclopedia article [on relativity theory] better than I like you," to which Pauli shot back, "That's strange. With me, regarding you, it is just the opposite." The two became very good friends from then on. Werner Heisenberg [in Physics and Beyond, 1971] recollects a friendly conversation among young participants at the 1927 Solvay Conference, about Einstein and Planck's views on religion. Wolfgang Pauli, Heisenberg, and Dirac took part in it. Dirac's contribution was a poignant and clear criticism of the political manipulation of religion, that was much appreciated for its lucidity by Bohr, when Heisenberg reported it to him later. Among other things, Dirac said: "I cannot understand why we idle discussing religion. If we are honest – and as scientists honesty is our precise duty – we cannot help but admit that any religion is a pack of false statements, deprived of any real foundation. The very idea of God is a product of human imagination. [ ... ] I do not recognize any religious myth, at least because they contradict one another. [ ... ]" Heisenberg's view was tolerant. Pauli had kept silent, after some initial remarks. But when finally he was asked for his opinion, jokingly he said: "Well, I'd say that also our friend Dirac has got a religion and the first commandment of this religion is 'God does not exist and Paul Dirac is his prophet'". Everybody burst into laughter, including Dirac. Many of Pauli's ideas and results were never published and appeared only in his letters, which were often copied and circulated by their recipients. Pauli may have been unconcerned that much of his work thus went uncredited, but when it came to Heisenberg's world-renowned 1958 lecture at Göttingen on their joint work on a unified field theory, and the press release calling Pauli a mere "assistant to Professor Heisenberg", Pauli became offended, denouncing Heisenberg's physics prowess. The deterioration between them resulted in Heisenberg ignoring Pauli's funeral, and writing in his autobiography that Pauli's criticisms were overwrought. Pauli was elected a Foreign Member of the Royal Society (ForMemRS) in 1953. In 1958 he became foreign member of the Royal Netherlands Academy of Arts and Sciences. In May 1929, Pauli left the Roman Catholic Church. In December of that year, he married Käthe Margarethe Deppner. The marriage was an unhappy one, ending in divorce in 1930 after less than a year. He married again in 1934 to Franziska Bertram (1901–1987). They had no children. ^ Dazinger, Walter (27 January 2014). "Preisträger" (PDF) (in German). Institut für Angewandte Synthesechemie, Vienna, Austria: Die Ignaz-Lieben-Gesellschaft Verein zur Förderung der Wissenschaftsgeschichte. Archived from the original (PDF) on 5 March 2016. Retrieved 9 January 2016. ^ a b c d e Peierls, Rudolf (1960). "Wolfgang Ernst Pauli 1900-1958". Biographical Memoirs of Fellows of the Royal Society. Royal Society. 6. doi:10.1098/rsbm.1960.0014. ^ "Pauli". Random House Webster's Unabridged Dictionary. 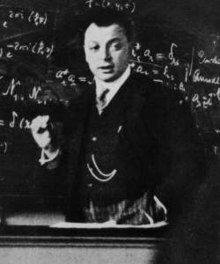 ^ "Nomination Database: Wolfgang Pauli". Nobelprize.org. Retrieved 2015-11-17. ^ "Jewish Physicists". Retrieved 2006-09-30. ^ Werner Heisenberg (2007). Physics and Philosophy: The Revolution in Modern Science. HarperCollins. pp. 214–215. ISBN 9780061209192. Wolfgang shared my concern. ... "Einstein's conception is closer to mine. His God is somehow involved in the immutable laws of nature. Einstein has a feeling for the central order of things. He can detect it in the simplicity of natural laws. We may take it that he felt this simplicity very strongly and directly during his discovery of the theory of relativity. Admittedly, this is a far cry from the contents of religion. I don't believe Einstein is tied to any religious tradition, and I rather think the idea of a personal God is entirely foreign to him." ^ Varlaki, P.; Nadai L.; Bokor, J. (2008). "Number Archetypes and Background Control Theory Concerning the Fine Structure Constant" (PDF). Acta Polytechnica Hungarica. 5 (2). Retrieved 2009-02-12. ^ Goudsmit, S.A.; translated by van der Waals, J.H. "The discovery of the electron spin". ^ Enz, Charles; Meyenn, Karl von (1994). Wolfgang Pauli, A Biographical Introduction. Writings on Physics and Philosophy. Springer-Verlag. p. 19. ^ Pauli, W. (1954). "Naturwissenschaftliche und erkenntnistheoretische Aspekte der Ideen vom Unbewussten". Dialectica. 8 (4): 283–301. doi:10.1111/j.1746-8361.1954.tb01265.x. ^ Atmanspacher, H.; Primas, H. (2006). "Pauli's ideas on mind and matter in the context of contemporary science" (PDF). Journal of Consciousness Studies. 13 (3): 5–50. Archived from the original (PDF) on 2009-03-19. Retrieved 2009-02-12. ^ "Wolfgang Ernst Pauli (1900 - 1958)". Royal Netherlands Academy of Arts and Sciences. Retrieved 26 July 2015. Wikimedia Commons has media related to Wolfgang Pauli.